Summer had finally hit us, it was hot and I didn't really feel like slaving over a hot stove. What to do? What would be light and easy? Well, I took a tip from a reader and grabbed me some seafood from See Woo supermarket in Greenwich. 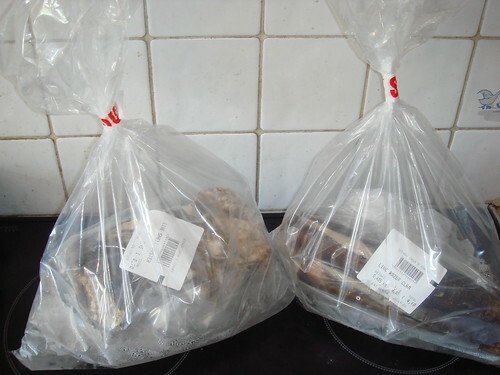 I came home with some live razor clams and oysters (yes, I know there's no "R" in the month, but whatever) all bagged up with ice chips. I'd worked up a bit of an appetite by then, so I prepped and ate them at once. However, it is possible to store them both for a day or two - both should be kept wrapped in a wet teatowel in the fridge. 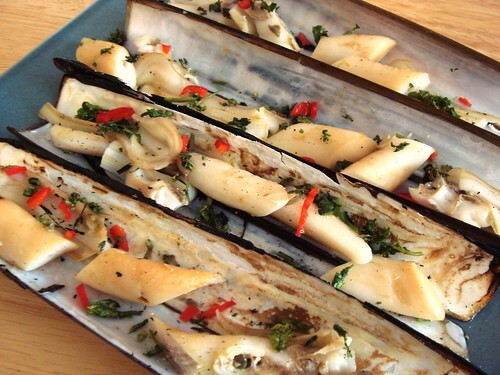 The razor clams required a little bit of effort, but it was well worth it. Although I still have nightmares about the plooshing noise the clams made as I washed them. De-seed the chillis and then slice into little slivers. Mince the garlic and put both to one side. 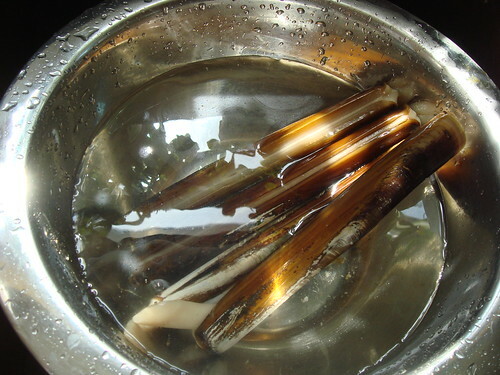 Quickly rinse the razor clams in running water to get rid of grit - don't soak them. Try not to freak out as the live clams begin to ooze out and loll around before closing up. Discard any that remain open. 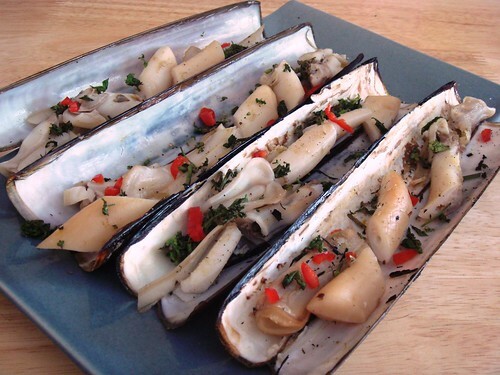 Place the clams on a baking tray and grill on high for 3-4 minutes. The clams should open up - remove from the grill and discard any that don't open. You should see a dark sac at the side of each clam - snip this off and discard. You should also see at one end of each clam what looks a bit like a mouth with tiny teeth (best not to look too hard) - remove these as well. 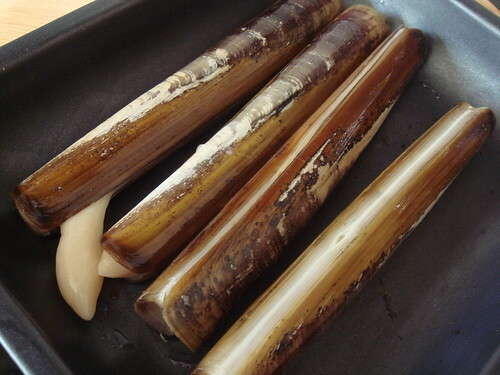 Next slice each razor clam diagonally into chunks. Sprinkle the garlic and chillies on top of the clams, drizzle the olive oil all over, and place them back under the grill for another 3 minutes. Remove from the grill, squeeze the lemon all over and serve immediately. Delicious, if slightly traumatic to prepare. 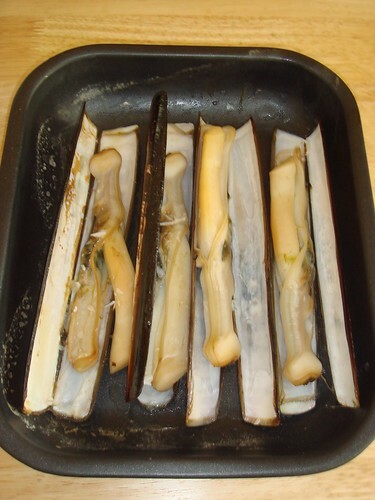 I've had raw razor clams before in a seafood platter in Edinburgh and while they were ... interesting, grilling them brought out the lovely salty flavour and meatiness, and I'd definitely make this again. Next time on meemalee's kitchen - the oysters! Hi thanks for your recipe! !turned out really well and tasty. I think it's safe to say that I'm going to be avoiding them like the plague. They sound FREAKY! Teeny tiny mouth? Teeth? Flobbing around all over the place??? NOOOOOO. I can happily live without them. I just started working in a fish plant on the razor shift. We send most of ours to china, very few fish mongers or restaurants sell them here in Ireland. 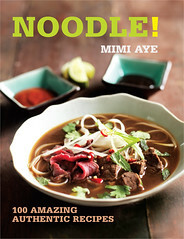 Tonight I decided to browse for recipes so I can actually try them. 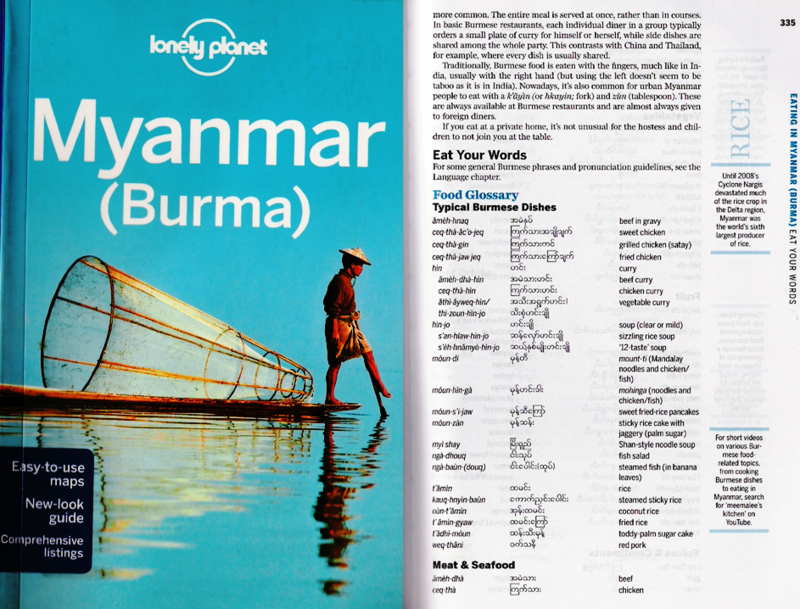 This is one I will try next week and leave a review (If I remember).